The energy and power sector was the most active for worldwide mergers and acquisitions in the first half of 2011 as the value of global deals of all types rose 41% from a year earlier to $1.5 trillion, according to Thomson Reuters. 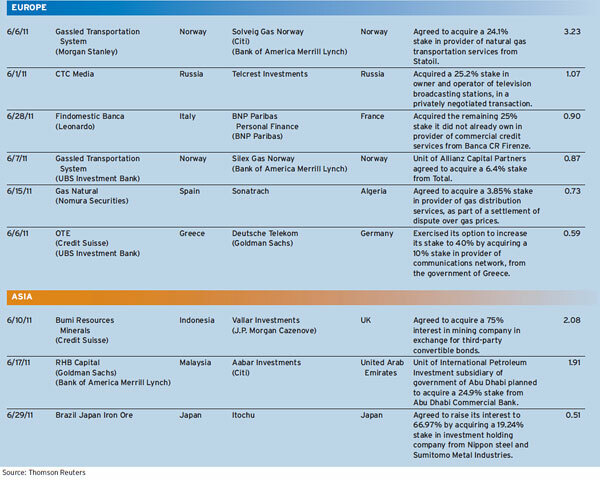 Energy and power deals led in both the US and Europe, while financial companies were the most acquisitive in Asia. The energy sector remained active in July as well. Australia-based BHP Billiton announced a $12.1 billion cash bid for Petrohawk Energy, a gas producer with shale assets covering about 1 million acres in Texas and Louisiana. BHP estimates that shale gas could account for half of the US gas market by 2030. The Australian miner says it could spend as much as $40 billion over the next decade to develop Petrohawk’s fields. Goldman Sachs topped the league tables for financial advisers in the first half—with a 23.4% market share. The firm advised on 194 deals valued at more than $350 billion. Morgan Stanley was second, followed by J.P. Morgan, Credit Suisse and Citi. M&A; activity in the US increased 71% in the first half over the same period last year, reaching $784 billion, according to Thomson Reuters. Energy and power deals accounted for more than 20% of the total. The biggest deal in the sector was Duke Energy’s proposed merger with Progress Energy. With a transaction value of $26 billion, the merger would create the largest US utility if completed. 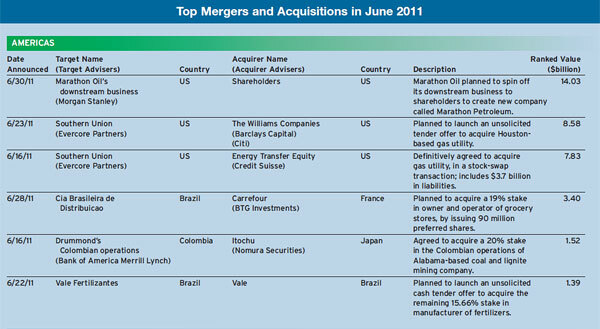 In the Americas, June M&A; activity was led by the oil and gas sector. In a deal valued at $14 billion, Houston-based Marathon Oil planned to spin off its downstream business to shareholders to create a new company named Marathon Petroleum. Across town, gas utility Southern Union was the target of a bidding war. On July 19, it agreed to a sweetened cash-and-stock buyout offer from Energy Transfer Equity of Dallas—rather than a bid from The Williams Companies. Energy Transfer Equity also reached an amended agreement to sell Southern Union’s 50% stake in Citrus, which owns the Florida Gas Transmission pipeline system, to Energy Transfer Partners for $2 billion. Announced M&A; deals in Europe, the Middle East and Africa totaled $629 billion in the first half, a 40% increase from the same period last year. Energy and power was the most active sector, with 751 deals valued at a total of $111 billion. The biggest deal was BP’s $9 billion offer to buy stakes in oil and gas blocks owned by India’s Reliance Industries. Ensco, an oil-drilling company from the UK, agreed to buy Pride International of Houston in a deal valued at $8.7 billion. The acquisition would create the world’s second-largest offshore drilling company after Switzerland’s Transocean. In another major European energy deal in the first half, Spain’s second-biggest oil company, Cepsa, was sold to Abu Dhabi sovereign wealth fund International Petroleum Investment for $7.4 billion. 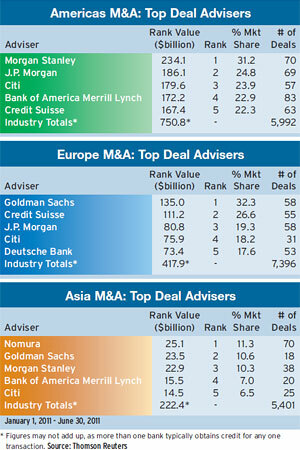 M&A; deals involving companies in Asia increased 11.2% in the first six months of 2011—to $218 billion. 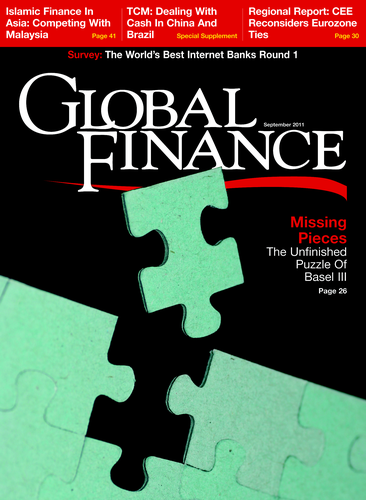 The financials sector was the most active in the region—with $36 billion in transactions stemming from 634 deals—followed closely by industrials, with $35 billion from 770 deals. Emerging markets accounted for 24% of worldwide merger activity in the first half, with deals valued at $356 billion. That represents an increase of 4% compared to the first half of 2010. Cross-border M&A; totaled $488 billion in the first half, accounting for 32% of announced deal volume, with the energy and power sector in the lead. M&A; advisory fees from completed deals totaled $16.7 billion in the first half, an 18.4% increase from the first half of 2010.